Evan Krewson gingerly carries the "Japanned" metal box. An important event in Orange County’s Centennial Celebration took place on the front lawn of the Old Courthouse on the morning of Nov. 10, 1988. 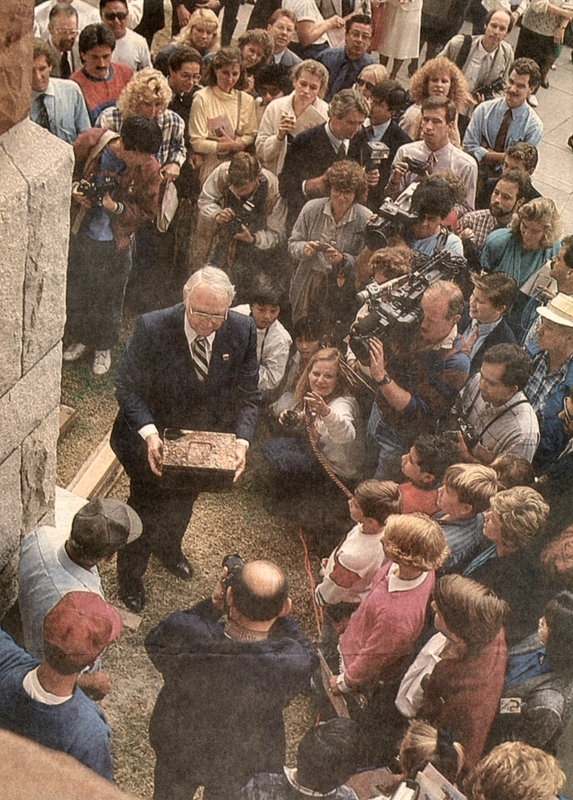 The photo above shows a time capsule from 1900 being removed from the cornerstone of the courthouse by Evan Krewson, who’d recently completed overseeing the historic building’s restoration. What treasures would be found inside? Supervisor Roger Stanton acted as master of ceremonies for the event, O.C. Historical Commission Chair Jane Gerber made some opening remarks, and historian Jim Sleeper oversaw the opening of the time capsule.
. . . A lot more than old dust was jostled free in the ceremony to retrieve a time capsule planted July 4, 1900, an open the Orange County Centennial Corporate History Exhibit. Signatures of county supervisors, a blank marriage license and a newspaper advertising daily milk delivery for $1.50 a month were among the historical treasures. But the highlight in the eyes of historians and archivists was the 200-year-old Spanish coin from the ruins of Mission San Juan Capistrano. 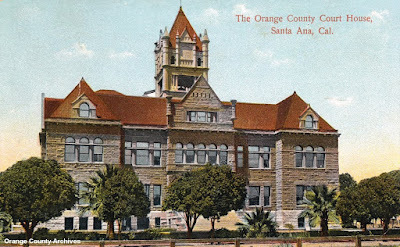 And though some of the documents had disintegrated into a pile of flakes and crumbs, archivists – dressed in white gloves to sift through the trove – were pleased that much of the box’s contents had survived their interment without benefit of hermetic seals or air-tight plastics.
. . . Several hundred people were interested enough to attend the Orange County Historical Commission’s opening of the time capsule on the grounds of the newly restored Old Orange County Courthouse in downtown Santa Ana. . . . Many boasted an Orange County heritage older than the courthouse. Before the capsule was lifted from the granite stone in which it has rested for 88 years, county Supervisor Roger Stanton called for audience members whose families had been in Orange County 100 years or more to stand and say the names of their forebears. One-by-one, the mostly white-haired children and grandchildren of county pioneers recounted stories of elders who had farmed, homesteaded and worked in Orange County a century ago.
. . . Masons slid the cornerstone out and a rectangular indentation covered with a scrap of metal and a thin slab of concrete were spotted. As for the condition of the documents inside, there was some disappointment. At the time the capsule was buried, the Santa Ana Standard newspaper had reported that the capsule was hermetically sealed. But the newspaper was obviously mistaken, county historian Jim Sleeper said as the decaying box was placed before him. Two holes had rusted through the metal cash box, allowing dampness to enter and destroy some of the papers rolled up inside. “Well, it looks like the county went low bid,” Sleeper quipped. The documents were put on temporary display in the courthouse museum and were expected to be removed today so they could be dried out and examined by [County Archivist Gabrielle] Carey and other archivists who will preserve the documents. Once properly preserved, the documents will be displayed publically, she said. Meanwhile, the Historical Commission is planning to fill the cavity left by the 1900 time capsule with a state-of-the-art, $1,000 stainless-steel box. Among the items that will go into it are photographs and records related to the courthouse’s restoration, current maps of Orange County and mementos and buttons from the Orange County centennial celebration. When the Old Courthouse was new. Map of Orange County, California by S. H. Finley, C. E.
James H. Hall, County Auditor wrote about the assessed value of real property in O.C., 1890-1900. M. A. Forester to F. P. Nickey, explaining the origin of the Spanish coin in the capsule. J. P. Greeley, County Superintendent of Schools wrote a summary of the county school system. City of Orange city officials and incorporation date.